David Cameron told ITV1's This Morning: "Striking isn't going to achieve anything, particularly while there are negotiations ongoing." Teaching unions are holding fresh talks with education officials but deny they are negotiations. The government wants public sector workers to pay more towards their pension schemes, retire later and accept a pension based on a "career average" salary, rather than the current arrangement based on their final salary. Unions say this will see their members working longer and paying more for a smaller pension. Mr Cameron said the changes were fair and it was important negotiations continued. "Let's get on and reach an agreement about the future of public sector pensions," he said. "As a country, we've got to make sure our public sector pension scheme is affordable. There are only two places where the money for public sector pensions can come from - it can come from the taxpayer or it can come from the people contributing themselves." Mr Cameron said that the disruption from the strike had been less significant than the unions involved had predicted. Government officials suggest 1.2m people walked out. "Obviously it was a big strike, but I think compared to what the unions had told us to expect - nine out of 10 schools shut and chaos at the borders - we didn't see that." Trades Union Congress general secretary Brendan Barber said the government should "turn its attention from trying to play down what was the biggest strike in a generation" and resume serious negotiations. "Unions want to see a fair, negotiated settlement and are ready for the intensive talks we now need, but those talks need content and that can only come from ministers," he said in a statement. Government ministers are not attending Thursday's talks between the main teaching unions and Department of Education officials. The health service unions will hold similar talks on Friday. Analysis: Start of long struggle? Arriving at the talks, NUT general secretary Christine Blower said teaching union heads were meeting officials in order to be "categorically clear that we have understood what the government is putting to us and to make sure that we have a coherent negotiation position". "At the moment we wouldn't characterise them as 'negotiations' we would say they're 'talks'. We hope that they will turn into negotiations," she said. PCS general secretary Mark Serwotka told the BBC's Newsnight programme on Wednesday that he did not believe government ministers were interested in negotiating. "They last met us on the 2nd of November and what they've said to us is 'that's our final offer... and now we want our officials to just talk to you about how you share out the pain'. We're saying 'we're not interested in sharing out the pain - you need to make concessions'," he said. Labour leader Ed Miliband said the government needed "to show flexibility" in talks over pensions changes. He urged both sides to return to negotiations to prevent further strike action. Liberal Democrat Treasury Minister Danny Alexander said there was still "a very good chance" of reaching a deal. Mr Alexander told the BBC News Channel there was "an awful lot of detail still to be discussed" and that Wednesday's strike action had been frustrating because it was happening "in the middle of a process of negotiations". "I think the key thing now is to get on with the process of discussions," he said. "What we agreed back in October, and we reinforced this at the beginning of November with our new, improved and, I think, very fair and generous offer, is that we wanted the talks to be carried on in the individual schemes." Mr Alexander said the Trades Union Congress (TUC) had asked for an increase in the money available for talks at a local scheme level and for protections for workers close to retirement. "We offered both of those things, we said that offer was contingent on agreement being reached - it remains contingent on agreement being reached - but I think there is actually a very good chance of reaching a deal," he said. Cabinet Office minister Francis Maude said ministers were prepared to alter what was currently being offered. A Downing Street spokesman said the government had always wanted matters to be resolved by the end of the end of the year but the NASUWT teaching union said the timetable was "impossible" for a complex issue. 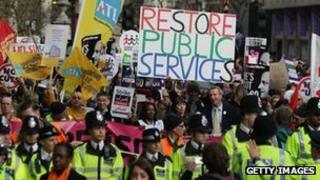 Public services are beginning to get back to normal after what was the biggest one-day strike since 1979. Hundreds of rallies were held in cities and towns across the UK. About two-thirds of state schools were shut and thousands of hospital operations were postponed as a result of the industrial action, with the Trades Union Congress (TUC) calling it "the biggest strike in a generation". Ministers have disputed the number of those who actually went on strike, putting it close to 1.2 million.